At J&l Custom Upholstery we do everything from mild to wild. The car on the left is 34 ford that has been completely re-done with a full custom interior, top and exterior. We fabricated our own custom top, door panels and even designed the trunk to match the rest of the car. We install leather kits, carpet kits, convertible tops (cloth & vinyl), Jeep tops and seat covers for all makes and models. 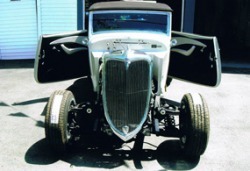 We can design a custom interior for your Hot Rod or custom vehicle. We also have the ability to re-stain/dye any material you would like. We can also restore things like headliners, sun visors, etc.